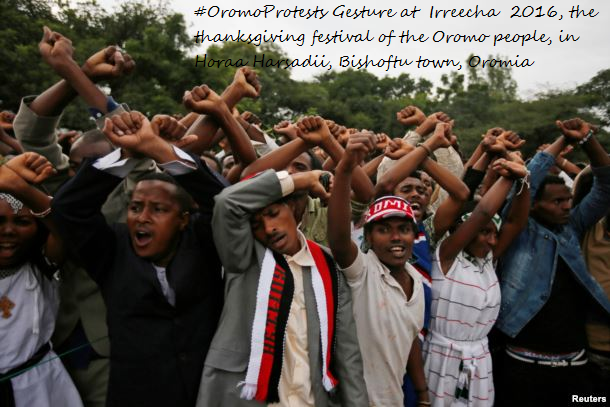 FILE — Demonstrators chant slogans and flash the Oromo protest gesture during Irreecha, the thanksgiving festival of the Oromo people, in Bishoftu town, Oromia region, Ethiopia. 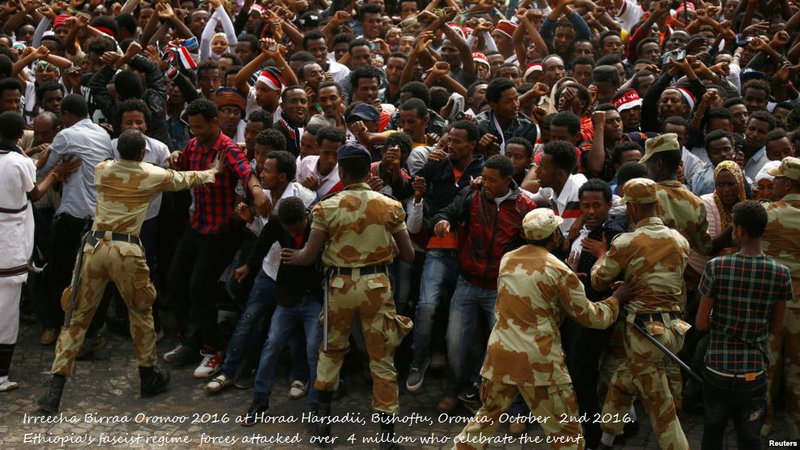 (VOA, WASHINGTON ) Ethiopia is observing an official mourning period for more than 50 people killed during a crackdown and stampede at an ethnic cultural festival in the Oromia region Sunday.At the same time, the country is seeing a continuation, possibly an escalation, of the anti-government protests that sparked the violence. 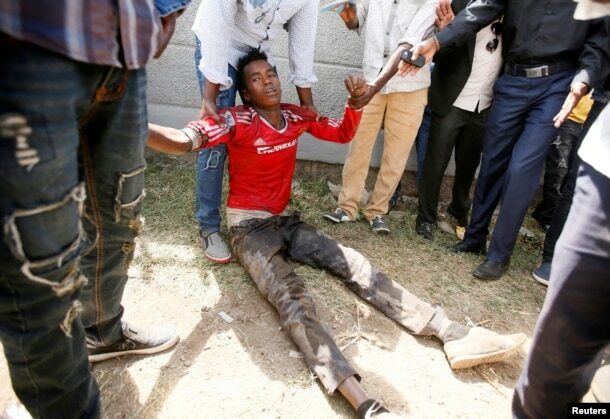 Hundetu Biratu took part in a protest that turned deadly Monday in Dembidolo, a town in southwestern Ethiopia. She told VOA that her brother was shot and killed during the demonstration. “We were taking my brother to the hospital. A bullet pierced his neck and exited through his ears. They fired tear gas and I fell. When I got up they shot me on my thighs and I fell,” she said. 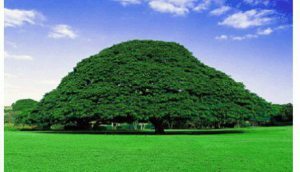 Mulatu Gemechu, assistant deputy chairman of the opposition Oromo Federalist Congress, said other protests took place Monday and Tuesday across eastern and western Oromia. He said clashes broke out in Sendefa, a town in central Ethiopia, as mourners returned from a funeral for a mother and a child who died in Sunday’s pandemonium. The Oromia Police Commission deputy commissioner, Sori Dinqa, told reporters that protesters in the region are destroying property, burning cars and targeting government offices. Demonstrators protest gesture during Irreecha, the thanksgiving festival of the Oromo people, in Bishoftu town, Oromia region, Ethiopia. More than 50 people were killed in the violence. “There are continued and sporadic efforts to block streets, disturb the peace and burn administrative buildings. Our police are continuing to prevent that. We want the people to condemn the uprising and discourage people from taking part in these acts,” he said. But few people appear to be heeding his call. A witness in Alem Gena, a town in central Ethiopia, said a funeral service for victims turned into an anti-government demonstration. He said no one was killed but anger in his area is running high. “We want our own government and those in the current government don’t represent us. They are incompetent to administer us and we want them to leave power,” said the man, who asked not to be identified for safety reasons. Official tallies put the death toll from Monday’s violence at 52, while Desalegn Bayisa, general manager of the Bishoftu Hospital, told reporters 55 people had been killed. Opposition members and activists, however, place the number of people who died in the hundreds. Bayisa said the hospital also treated more than 100 injured people. Advocacy groups such as Freedom House blamed some of the deaths on security forces firing tear gas and live ammunition at festival attendees. Questions about safety precautions are also being asked of the organizers of the festival, which drew hundreds of thousands of people to a location that includes a lake and deep ditches. FILE — People assist an injured protester during Irrechaa, the thanksgiving festival of the Oromo people in Bishoftu town of Oromia region, Ethiopia. “It’s amazing really. There seemed to be no preparation or planning about how to manage the flows of people,” said William Davison, a reporter for Bloomberg News who attended the event and said there were no barriers between the people and the ditches. “To make those mistakes given the high likelihood of a protest and a government response just seems sort of criminally negligent to me,” Davison added. Free speech advocates say the government was attempting to silence critical voices even before the festival. Seyoum Teshome, a prominent Oromo blogger and lecturer at Ambo University, was arrested on October 1 in Wolisso, 110 kilometers from the capital of Addis Ababa. His house was searched and the police confiscated his computer according to local reports. “My attempts to reach him via his phone ended unsuccessfully. May he stay safe,” wrote Befekadu Hailu, another blogger, on his Facebook page. The Committee to Protect Journalists (CPJ), a group advocating for the safety of journalists, condemned the arrest and called on the government to release Teshome without delay or conditions. It is “deeply disturbing as it comes against a backdrop of government moves to stifle protests and criticism,” CPJ’s deputy director Robert Mahoney said. Analysts see no end in sight to the ethnic tensions roiling Ethiopia. Jeffrey Smith, executive director of Vanguard Africa Movement, a group that advocates for good governance, said protesters do not feel the promise of Ethiopian federalism, in which all regions are supposed to have a degree of self-governance, has been realized. Adane Tilahun, the chairman of the opposition All Ethiopian Unity Party, said that to begin the healing process from this week’s events, the government needs to recognize the killings were unjustified, apologize, and offer compensation to the families of the victims. Tilahun also called on international actors and human rights groups to put pressure on the Ethiopian government in order to establish an independent investigation into the deaths. VOA reporters Tujube Hora and Solomon Kifle contributed to this report.